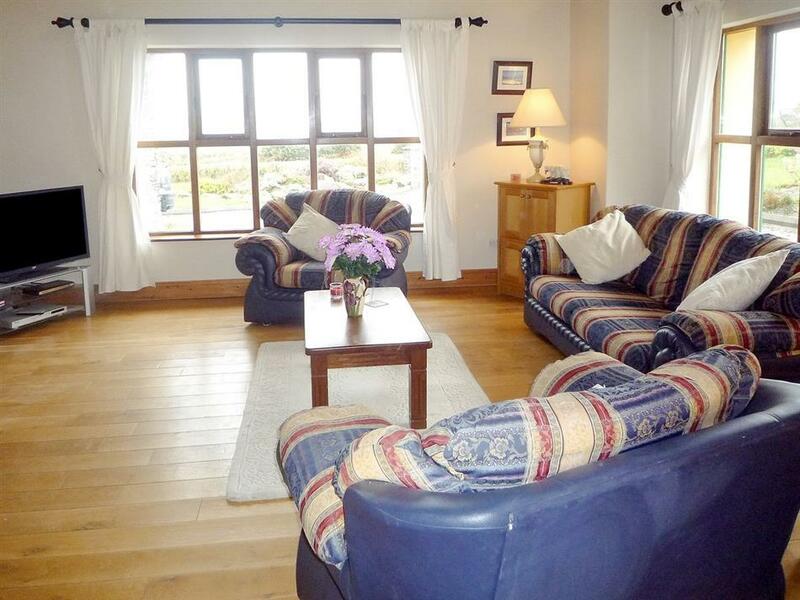 Bartregaum in Castlemaine, County Kerry sleeps 8 people. 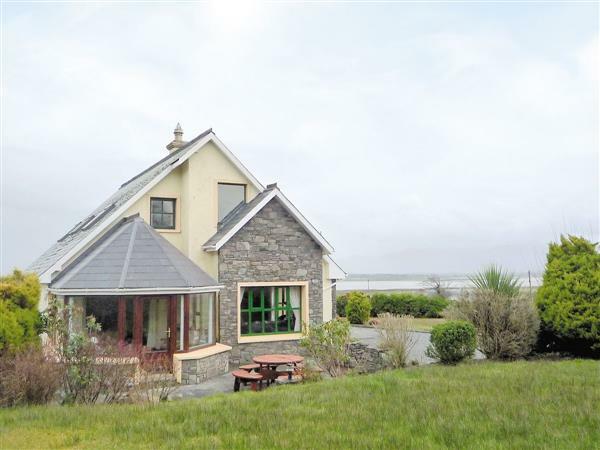 Located on the Wild Atlantic Way, Bartregaum is a detached holiday property which offers beautiful views across Castlemaine Harbour. The house has great living space, with a large living room with cathedral ceilings, a spacious dining room/kitchen and an attractive sun room which overlooks the wonderful gardens, which makes a perfect place to relax and soak in the beauty of the softly tinted mountain and glorious sea views. The house is just 7½ miles from Inch Beach, with its miles of golden sands. Besides easy access to the spectacular scenery of the Dingle Peninsula, the house is also the perfect base for exploring the magnificent panorama of the Ring of Kerry. There are many fine golf courses in this area, along with opportunities for walking, cycling, fishing, surfing and horse riding. The beach is 8 miles, the shop is 2 miles, and the pub is 2½ miles from Bartregaum in County Kerry. Living room. Dining/sun room with patio doors/kitchen with tiled floor. Utility room. 1 double (5ft) bedroom with en-suite bathroom with shower over bath and toilet. Separate toilet. First floor: 3 bedrooms: 1 double with en-suite shower room and toilet, 2 twin. Bathroom with shower over bath and toilet. Most rooms with wooden floor. Open fire in living room (initial fuel included). Gas central heating, gas and electricity by meter reading. Bed linen and towels included. Two travel cots. High chair. 41 freesat TV. DVD. CD. Gas cooker. Microwave. Washing machine. Tumble dryer. Dishwasher. Fridge/freezer. Wi-Fi. Large lawned garden with patio, sitting-out area and furniture. Gas barbecue. Ample parking. NB: Steps from sun room to garden. 6 steps in garden. For a better idea of where Bartregaum is, you can see Bartregaum on the map below. Do you want to holiday near Bartregaum (W32152), you can see other cottages within 25 miles of Bartregaum; have a look to find your perfect holiday location.